French Foreign Minister Laurent Fabius arrived in Tehran on Wednesday in an historic visit, becoming the first French foreign minister to arrive in the Islamic regime in 12 years - but local Iranians were less than happy to see him. Dozens of Iranian university students and activists protested Fabius's arrival at Tehran International Airport, according to the semi-official Fars News Agency. The protesters bore signs in Farsi and in French, and chanted "Fabius, servant of the US, spy of Israel." The hostile response despite the nuclear deal brings to mind the comments of Brig. Gen. Mohammad Reza Naqdi, Commander of Iran's paramilitary Basij Force, who last Tuesday said Iranians will "hate the US 100 times more" due to the deal. Aside from protesting his perceived firm stance in the Iran nuclear deal, the protesters also opposed a scandal in which blood contaminated with HIV was knowingly imported from France to Iran between 1984 and 1985. Fabius was prime minister at the time, but was acquitted of manslaughter charges in court. "AIDS, a French gift to Iran," shouted the protesters, along with "we neither forgive nor forget," and "no welcome to AIDS lord." Fabius is to meet with his Iranian counterpart Mohammad Javad Zarif, as well as Iranian President Hassan Rouhani, to discuss expanding economic cooperation now that sanctions are to be lifted in the controversial Iran nuclear deal. But Iranian analyst Seyed Mostafa Behnam was quoted by Fars saying the bad blood with Fabius still exists, accusing him of taking a "tough line during Iran’s nuclear negotiations with the P5+1 (world powers) during the past two years." 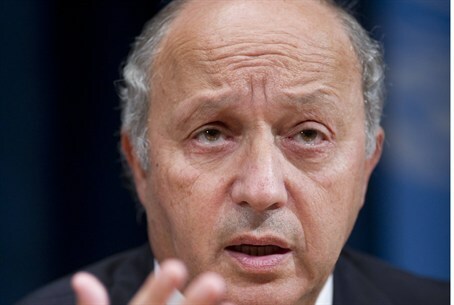 "Fabius put a spanner in the wheel of negotiations due to his affiliations with the Israeli lobbyists and Saudi petrodollars," claimed the Iranian analyst, saying France showed a firmer stance than the US during the talks. Iran is to receive hundreds of billions of dollars in sanctions relief that US President Barack Obama has admitted will likely go to its funding of global terrorism. The deal was revealed to have a classified section detailing that Iran will inspect its own covert nuclear facilities.